Late Surjit Bindrakhiya was famed for his hekh, where he used to sing a note continuously in one breath. His hits include,'Dupatta Tera Satrang Da','Bas Kar Bas Kar','Tera Yaar Bolda'and 'Jatt Di Pasand'. He is considered to have one of the greatest voices in the history of Bhangra. 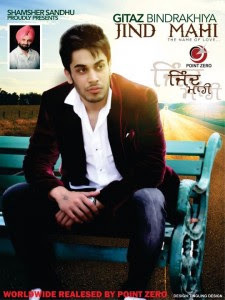 Now with lyrics and presentation of Shamsher Sandhu, Gitaz will surely make his presence count. His first album, 'Jind Mahi', will be out on point zero. This is one of the most anticipated album in Bhangra Industry and the boy is sure to get all the support from the legends of the industry in his endeavour.